, an English physician of considerable celebrity as a practitioner, was the second son of David Alcock of Runcorn in Cheshire, by his wife Mary Breck, and was born in that place, Sept. 1707. He was initiated in reading and grammar by his parents, and afterwards placed at a neighbouring school, which he soon left upon some disgust. After however passing some time in idle rustic amusements, he was roused to a sense of duty, and resolved to return to school, and to qualify himself for the study of medicine, if his father would give up to him a small estate, about 50l. a year, with which he engaged to maintain himself. 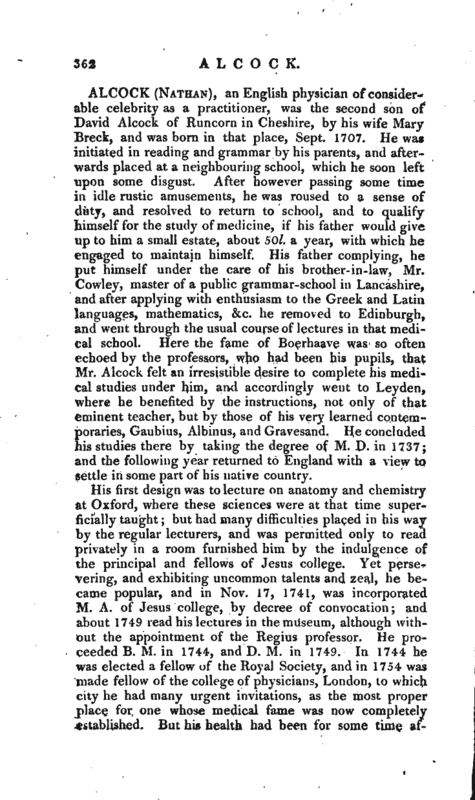 His father complying, he put himself under the care of his brother-in-law, Mr. Cowley, master of a public grammar-school in Lancashire, and after applying with enthusiasm to the Greek and Latin languages, mathematics, &c. he removed to Edinburgh, and went through the usual course of lectures in that medical school. 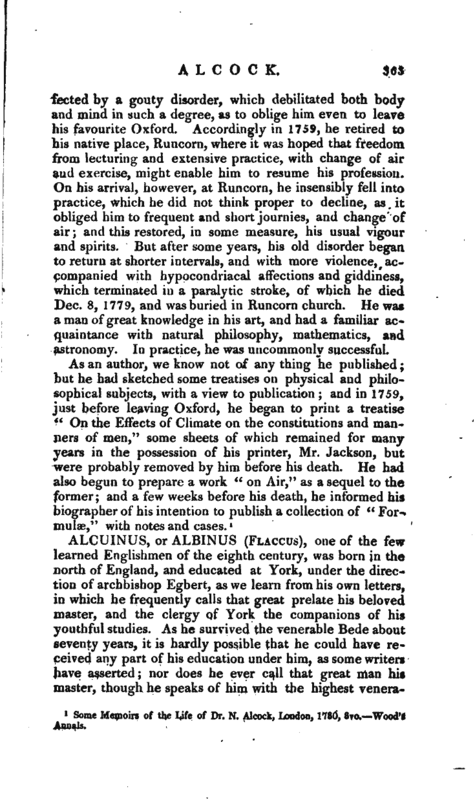 Here the fame of Boerhaave was so often echoed by the professors, who had been his pupils, that Mr. Alcock felt an irresistible desire to complete his medical studies under him, and accordingly went to Leyden, where he benefited by the instructions, not only of that eminent teacher, but by those of his very learned contemporaries, Gaubius, Albinus, and Gravesand. He concluded his,studies there by taking the degree of M. D. in 1737; and the following year returned to England with a view to settle in some part of his native country. His first design was to lecture on anatomy and chemistry at Oxford, where these sciences were at that time superficially taught; but had many difficulties placed in his way by the regular lecturers, and was permitted only to read privately in a room furnished him by the indulgence of the principal and fellows of Jesus college. Yet persevering, and exhibiting uncommon talents and zeal, he became popular, and in Nov. 17, 1741, was incorporated M. A. of Jesus college, by decree of convocation; and about 1749 read his lectures in the museum, although without the appointment of the Regius professor. He proceeded B. M. in 1744, and D. M. in 1749. In 1744 he was elected a fellow of the Royal Society, and in 1754 was made fellow of the college of physicians, London, to which city he had many urgent invitations, as the most proper place for one whose medical fame was now completely established. But his health had been for some time | atfected by a gouty disorder, which debilitated both body and mind in such a degree, as to oblige him even to leave his favourite Oxford. Accordingly in 1759, he retired to his native place, Runcorn, where it was hoped that freedom from lecturing and extensive practice, with change of air and exercise, might enable him to resume his profession. On his arrival, however, at Runcorn, he insensibly fell into practice, which he did not think proper to decline, as it obliged him to frequent and short journies, and change of air; and this restored, in some measure, his usual vigour and spirits. But after some years, his old disorder began to return at shorter intervals, and with more violence, accompanied with hypocondriacal affections and giddiness, which terminated in a paralytic stroke, of which he died Dec. 8, 1779, and was buried in Runcorn church. He was a man of great knowledge in his art, and had a familiar acquaintance with natural philosophy, mathematics, and astronomy. In practice, he was uncommonly successful. Some Memoirs of the Life of Dr. N. Alcock, London, 1780, 8vo. Wood’s Annals.